We recently traveled through Sikeston on motorcycles headed to Shenandoah National Park all the way from central Texas. 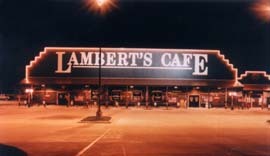 Anytime we get a chance to eat at Lambert’s we always take it! 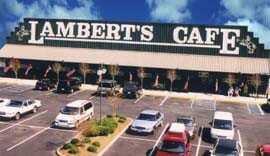 So the next time Kim came around he asked her if she offered carry out service. She, of course, said yes and then her told her she was going to have to carry him out. Well, she didn’t miss a beat coming back with “Well hop on! 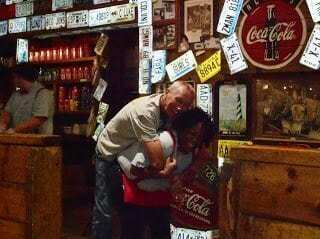 I’ll carry you out!” And he took her up on it! My picture was hurried and not the best quality but this had to be recorded! 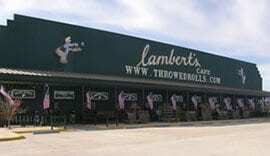 Thanks Lambert’s and Kim R. for helping us make some great memories…..we hope to visit again soon. Previous30th Anniversary Celebration	NextThe Schaffhauser’s from Bono, Arkansas!